The common question one would ask a dentist after a dental restoration would be, ‘How long would this last?’ Dental restorations do not come cheap therefore many would want to be reassured that their money is well invested in something that would, desirably, last a lifetime. However, nothing is permanent. This is an important question that many tend to ask when a dental crown, dental bridge or dental implant is being discussed with their dentist. The honest answer would be ‘I do not know’ though this answer may not satisfy anyone who is going to invest a big sum of money on the dental restoration. Prognosis of a bridge cannot be guaranteed. Some start with a better chance of survival than others. 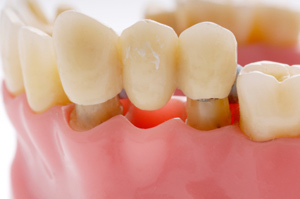 Most tooth bridges do not wear out, neither do the supporting teeth. Failure is the result of an isolated incident, a progressive disease process, or bad planning or execution in the first place. The prevention of tooth decay and periodontal disease is largely under the control of the patient, assisted and monitored by the dentist and hygienist. Some changes affecting tooth decay and gum disease cannot be predicted. These include dietary changes, drugs producing a dry mouth, the onset of a general disease such as diabetes and old age changes that may make cleaning difficult. Therefore there is no consistent reliable figure to give but based on multiple survey data conducted throughout the years, a small (three-unit) well-made conventional dental bridge may last around 20 to 50 years, whereas large conventional bridges and minimum-preparation or adhesive bridges can last around 15 to 30 years. Tooth decay can proceed rapidly as the tooth dentine is exposed during tooth preparation on the supporting teeth to fit the bridge. 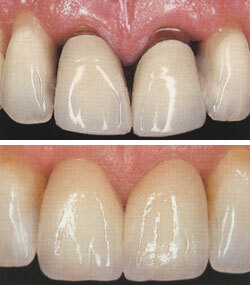 If tooth decay is limited to the margin of the dental bridge, it is restored without removing the bridge. Teeth that have suffered attack from tooth decay, subjected to pins and core placement, traumatic tooth preparation procedures may become non-vital or dead and may lead to disease formation at the root of the tooth, for example pus or abscess formation. Management of such cases is by root filling the tooth through an access cavity in the crown of the supporting tooth. Root surgery would also be an option depending on how severe the root disease is. The lack of meticulous plaque removal or poor oral hygiene will result in inflammation at the margins of the dental bridge particularly the small gap between teeth. 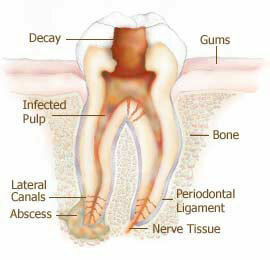 Symptoms of gum disease can manifest as pain on biting, pain on tapping the dental bridge and a shaky or mobile bridge. Regular reinforcement of oral hygiene instructions with regular review and recall visits to the dentist is necessary to keep your mouth healthy. Poor stability of the supporting tooth due to tooth preparation was not done following the principles of tooth preparation. Different loading force on the supporting teeth due to improper design of dental bridge. Fatigue of the cement due to the inadequate biomechanical properties of the cementing agent. If your teeth do not meet evenly with the dental bridge on, then you have an incorrect bite. Sometimes it can lead to muscle pain in the mouth muscles similar to jaw pain. If the difference is small then it can be corrected but if the difference is too large, the bridge has to be replaced. If there is muscle pain, your dentist will first stabilize the condition by providing a soft splint till the problem is corrected. The ceramic or tooth-colored portion of the bridge can fracture most likely due to the incorrect metal substructure design in which the ceramic portion is not supported. Ceramic can also fracture if there is not enough tooth preparation done by the dentist which can lead to formation of a thin ceramic layer in the end product which can easily fracture. The most vulnerable component for a well-made bridge is the ceramic. Ceramic may absorb water and undergo change which makes it lose its glaze and become lighter in color. Changes in color can affect esthetics and can only be improved by replacing the whole dental bridge. This entry was posted in Dental Bridges and tagged adhesive bridge, conventional bridge, dental bridge, dental bridges, dental crown, dental implants, How Long Do Dental Bridges Last, tooth bridges on August 26, 2011 by oileng.